Hoyle Hodges served in the U.S. Army as an Infantry Paratrooper for 24 years, and retired on 1 January 2004. He served multiple combat tours, overseas tours, and has many assignments within the United States as well. He served in every Leadership position from Private to Command Sergeant Major and received numerous Awards and Decorations for both combat and peacetime duties. He retired as the Command Sergeant Major of the 2nd Battalion 505th Parachute Infantry Regiment, 82nd Airborne Division. A graduate of Evergreen State College in 2013, he ran a year- long business development project delivering cargo under sail power with his 60’ schooner the “Pleiades”. After this adventure Hoyle founded and operates the Olympia Schooner Company. 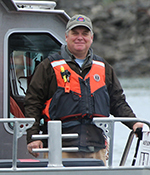 Hoyle Hodges joined the Washington State Parks & Recreation Commission as the Marine Law Coordinator serving the marine law enforcement community and citizens of Washington state in April 2014. Hoyle is a United States Coast Guard licensed Captain. He resides with his wife Elmira and daughter Heidi in Olympia, WA.